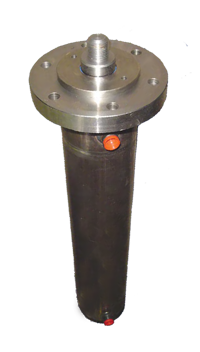 Quality single acting front flange mount hydraulic cylinders, available in a range of standard stroke lengths. Many of our front flange cylinders are currently in stock, so buy online now for fast lead times and doorstep delivery. All front flange cylinders can be supplied with a matt black paint finish, and other special paint finishes can be also be supplied - just contact us with your requirements. This range of cylinders produces 2.5 to 16 tons of force at 210 BAR (3000PSI).Our front flange hydraulic cylinders bore sizes range from 40mm to 100mm.